Drewe started his career as a trainee at Norwich City where between 1996 and 1998, he made three League starts and six substitute appearances, scoring one goal in the process. Whilst at the Canaries, Drewe was loaned out to Wigan Athletic for one month in August 1997, where he was involved in eight games at the start of the 1997/1998 season. Unwanted by Norwich, both Brentford and Peterborough United put in bids for the striker and on 28 October 1998, he signed for Brentford for £100,000. After just a single appearance however, Brentford and Peterborough came to an agreement and just nineteen days later, he joined the Posh for the same transfer fee. He went straight into the first team, scoring three goals in five games, but injuries and loss of form saw him finish the season on the bench. He remained with Peterborough the following season but made little impact and after 39 appearances (17 as substitute) and 9 goals, he went out on loan to four different clubs during the remainder of his stay – Nuneaton Borough (February to May 2000), Dagenham & Redbridge (September to December 2000), Stevenegae Borough (December 2000 to January 2001), and Kidderminster Harriers (January to February 2001). At the end of that final loan, he moved to Kidderninster on a permanent basis, with Harriers paying out a £50,000 transfer fee to keep him at Aggborough until the summer of 2003. Drewe made 103 appearances for Harriers (including the loan period), and scored 23 goals, but was released at the end of his contract. 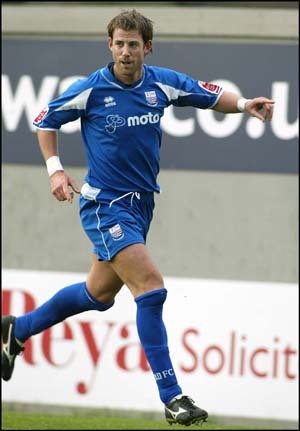 During June 2003, he signed for Southend United on a free transfer but a shortage of goals saw him made available for a loan move again, and he arrived at Nene Park on 14 October 2004 for an initial period of one month – later extended to two months before returning to Roots Hall. In 10 games for Diamonds, he scored five times, including a hat-trick in the 5-1 win against Notts County. He returned to Southend on 15 December, and immediately went on loan to Wycombe Wanderers. He was recalled on 11 February 2005 in order to complete a permanent move to Nene Park. He quickly set up a partnership with loanee Billy Sharp and perhaps his finest moment for Diamonds came shortly after he had returned when he scored one of the three goals that beat Northampton Town at Nene Park. Unfortunately, in his next match, he picked up a red card against Lincoln City, and the ten-man Diamonds quickly conceded three goals losing 1-4. 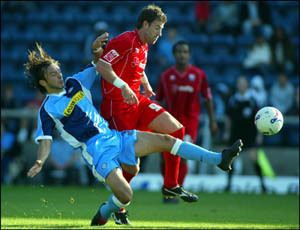 He struggled with disciplinary problems on the field, and in addition to many yellow cards, he picked up two red cards in the first two months of the 2005/2006 season as the Diamonds struggled to stay in the Football League – finally leaving the club after he had been unable to help them avoid the drop to the Conference in 2006. He scored 10 goals in 39 appearances during that season. Drewe was released in May 2006, joining League Two side Chester City on 16 June 2006, but went out on an end of season loan to Boston United in October 2006, but he was again unable to help them avoid the drop out of the Football League in 2007. He then moved to the MK Dons in the summer of 2007. but again went out on loan in January 2008, this time to Wrexham, but he was once again unable to help them avoid the drop out of the Football League in 2008. In August 2008, he joined Rotherham United, and scored 13 goals in 69 games for the Millers. Towards the end of his stay, he went on loan to Lincoln City in February 2010, and eventually joined the Imps on a permanent basis at the end of the season. After 20 games including just 9 starts however, he had still to score for the Imps and on 18 February 2011, went out on loan to Conference side AFC Wimbledon, but was recalled by Lincoln on 31 March after just 8 appearances, and two goals for the Dons. He made four appearances for Lincoln on his return but once again, he was unable to help them avoid the drop out of the Football League in 2011. During July 2011, he went on trial at newly promoted Conference side Alfreton Town and after initially failing to gain a contract, he signed for the Reds on 8 September 2011 on a non-contract deal, but following a red card on 1 October, he was released. He joined Conference South side Thurrock on 21 October 2011. Drewe was released after less than three months, and joined Southern League Premier side Arlesey Town on 19 January 2012. His stay was short lived however and he joined Conference side Darlington on 2 March 2012 until the end of the season to try to help them escape the threat of relegation. He picked up a red card in the Quakers penultimate game of the season, having been unable to help them avoid the drop out of the Conference in 2012. He retired from the game shortly afterwards.